Itachi sought to protect his younger brother from Uchiha Madara. To that end he used a jutsu to implant his Mangekyou and its techniques into Sasuke. When Sasuke's Mangekyou was initially activated, it resembled the version seen in Itachi, due to Itachi's sealing of Amaterasu into Sasuke's eye as a defense mechanism. 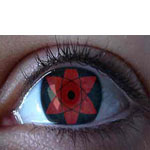 Later Sasuke's Mangekyou took on its own look. Even though it bore a new shape, Sasuke was still able to utilize Amaterasu. The lenses expire 90 days from the day of opening. These lenses are for cosmetic use ONLY. The crazy wild lenses do not come in prescription. These lenses are a soft contact lens. We do not have these in stock, please leave us your email and we will contact you when they have arrived. Sorry this product is unavailable. These Dual Colored Lenses in Prescription are Out Of Stock, You might like to try the Freshlook Colors instead. Let the power of Geass be yours!